Shapiro documents the origins and progress of each new development in drugs and pop, from bebop virtuosos on heroin to the LSD soaked visions of 1967 San Francisco and from reggae's love affair with "herb" to the amphetamine fuelled rage of punk, and tells the stories of music's famous drug casualties - Charlie Parker, Jimi Hendrix, Jim Morrison, Keith Moon, Sid Vicious - while examining the headline grabbing tactics of drug enforcement agencies, the perils of ill-conceived anti-narcotics legislation, and the hypocritical collusion of the billion dollar record industry. "Telling the long, entwined history of drugs and popular music, Shapiro ... unravels the associations that have brought drugs and rock music together in popular consciousness and tries to find why so many of its performers ahve succumbed to temptation. 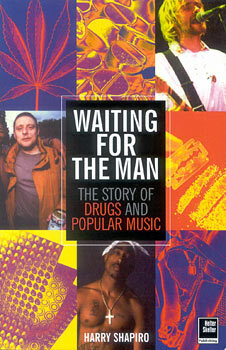 First published in 1988, the book has now been brought up to date with much worthwhile material about events in the past decade, particularly relating to ecstasy and dance music." "Shapiro knows his stuff in detail - both musical and medical." "A Book you should read." Harry Shapiro has worked in teh drugs field since 1979. He is the author of acclaimed biographies of Alexis Korner, Eric Clapton, and Jimi Hendrix. He lives in London. His next book is Shooting Stars: Drugs, Hollywood and The Movies [Serpents Tail, 2003].